The two paintings are now collected in a single frame, but before they were joined by a hinge that allowed them to open up like a book. This peculiarity make the experts think about a private object not intended to be hung in the halls of the Ducal Palace. Both figures are portrayed in profile in the foreground against a very light background in the distance. The contrast between near and far makes the two characters look almost eternal. 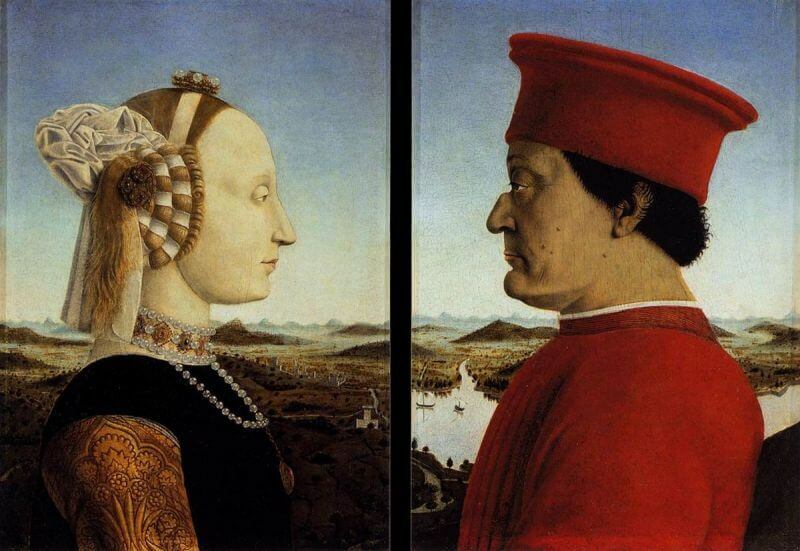 Federico da Montefeltro has a very naturalistic aspect: the proud gaze looking away, the broken nose, the small wrinkles and moles. The Duke had lost his right eye in a tournament so he was portrayed only on the left profile. Battista Sforza is characterized by extremely light skin, symbol of nobility at the time. The forehead is high as imposed fashion and the rich magnificent costume jewelry and precious gems. On the back of the pictures shows the "Triumphs". Federico da Montefeltro is shown seated on a chariot along with the four cardinal virtues. Battista Sforza, meanwhile, embodies instead the marital virtues.